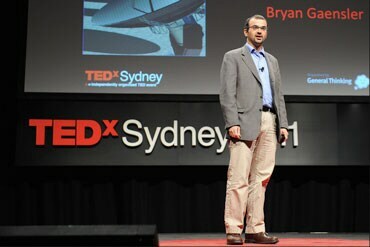 Professor Bryan Gaensler, from the School of Physics at the University of Sydney, and Director of the ARC Centre of Excellence for All-sky Astrophysics (CAASTRO), was invited to present as a guest speaker at TEDxSydney on Saturday 28 May 2011. TEDxSydney is a local version of the US-based TED enterprise which brings together people from three worlds: Technology, Entertainment and Design. Speaking first on the day, Professor Bryan Gaensler spoke for 15 minutes on his research in astronomy and the big questions about our universe currently being investigated. He joined 26 other invited speakers and performers at TEDxSydney 2011. 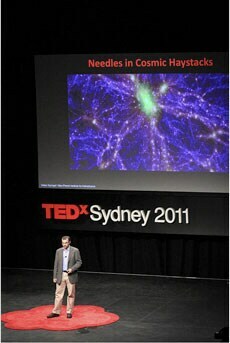 Professor Bryan Gaensler, from the School of Physics at the University of Sydney, and Director of the ARC Centre of Excellence for All-sky Astrophysics (CAASTRO), was invited to present as a guest speaker at TEDxSydney on Saturday 28 May 2011. Photo: Enzo Amato for TEDxSydney. The full day event was held at CarriageWorks in Redfern, with an audience of 700 people in the theatre and a further 1300 people watching the live broadcast in the CarriageWorks foyer. The talks were also streamed live on YouTube and broadcast on ABC Radio National. "In my TEDxSydney talk, I spoke about the things we still don't know about the universe and how we in Australia are taking a new all-sky approach in astronomy to try to answer these questions," said Professor Gaensler. Professor Gaensler started his entertaining talk, by putting the entire history of the universe on one slide - from the Big Bang to the present day. "I described what we know about the history of the universe - from the Big Bang through the long period of the cosmic 'Dark Ages', to the 'Cosmic Renaissance' when stars and galaxies started to form, and then through to the present day," explained Professor Gaensler. "While we know a lot about the beginning - the Big Bang - and about the universe now, we know very little about what went on during the Dark Ages and Cosmic Renaissance. "The universe is also changing quite quickly - it's dynamic. So not only do we not understand it, but it's full of variable phenomena." The audience was amused by Professor Gaensler's explanation of the fact that only 5% of the universe is made of atoms, while the rest is termed 'dark matter' while scientists attempt to understand it. He used a saying from colleague Bob Kirshner, from Harvard University: The universe is like Los Angeles - it's only 5% substance and 95% energy! Professor Bryan Gaensler entertained and informed the audience at TEDxSydney 2011 with an insight into astronomy research and the big questions about our universe currently being investigated. Photo: JJ Halans for TEDxSydney. "We are trying to understand how our universe formed, how it evolves and what most of it is made from, and we're not even looking at the whole sky," said Professor Gaensler. "The new approach to astronomy is an all-sky one, because we recognise that understanding the universe can't be done by simply looking at individual objects, but requires us to look at the whole sky at once. I spoke about some of the work being done by CAASTRO and what we will be able to do with the Square Kilometre Array - the world's largest radio telescope - once it is built." Professor Gaensler left the audience with the message that astronomers are investigating the unknown unknowns - the things we don't know that we don't know - which have the potential to change the world. There are some big problems out there that astronomers are embarking on an exciting journey to solve, and this is happening here in Australia thanks to clever Australians. After giving his presentation, Professor Gaensler was able to enjoy the rest of the TEDxSydney talks on the day. "Most of the presentations were very thought provoking and clever talks. TEDxSydney offers great networking opportunities, which have the potential to result in long-term impacts for society, business or research." "I've had various people asking follow-up questions by email or twitter, which shows that these talks can get people curious about new areas," said Professor Gaensler. TEDxSydney is organised by the General Thinking network, founded by Remo Giuffré, and is a not-for-profit enterprise.